You want to keep your cat safe when she is outside. There are many risks; other cats, predators, disease, traffic and other dangers. - and if your cat likes to "roam", you know what I mean. Black cats are especially vulnerable around Halloween. 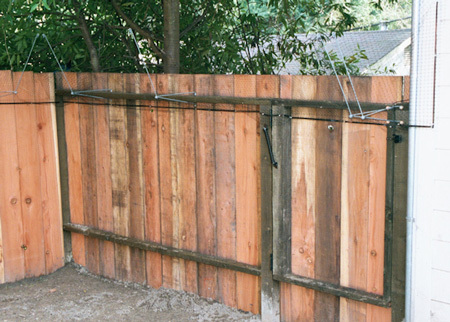 The purpose of a cat barrier/cat fence is to give your cat access to the outdoors while keeping her safe. 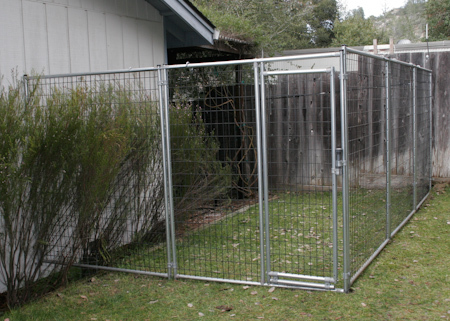 Most barriers are also designed to keep neighbor cats and other animals out. A cat barrier can significantly reduce many of the greatest risks to your cat; give you peace of mind, and help keep your vet bills down. An effective cat barrier may also prevent the need for a completely enclosed cat run area which can get expensive and can make your house look like a zoo. Your "inside" cat may even be able to safely enjoy the outdoors. This can do wonders for making her happier and healthier. There are a number of different types of cat barrier and fence products which let you turn your cat's natural environment - your yard, into a cat-safe outdoor play area without cramping your sense of decor. Each product takes slightly different approaches to the protection of your favorite feline. They are all similar in that they use variations of plastic netting and a series of hardware brackets and/or posts. Some of these cat fence products are reasonably unobtrusive and do not adversely affect the look of your home or yard. You can greatly improve your cat's protection, and still not feel like you're living in Fort Knox. All of these companies sell their own complete cat barrier products, solutions and accessories. Several companies sell components separately, so you don't have to purchase complete products to get the components you need for an effective protection solution. All of these products can be assembled and set up with basic tools and none use electricity or electronic deterrent methods. Portable dog kennels from various manufacturers. This is a "fence-topper" product which uses 36" wide plastic mesh which can be attached to an existing chain-link, masonry, or wooden fence with large washers every 4-6 feet. The mesh is hung from one-piece metal stanchions attached to the fence at regular intervals. Metal brackets or "stanchions" are only one piece, easy to install and they position the top of the plastic netting higher up. Plastic netting itself is thin and tears easily. Plastic netting is attached with large washers at regular intervals. In order to keep a determined and strong cat from getting under the edge of the netting, the netting has to be stretched tight and washers have to be spaced only inches apart which greatly increases the installation time and makes it more time-consuming and harder to make necessary repairs. Appearance of the completed installation is not as visually attractive as components from other companies. After several years in the sun, the netting expands, droops, and becomes brittle and weak. This product is also a "fence-topper". It uses 36" wide thin plastic netting with a strong plastic band woven into one edge. The band is secured along an existing masonry or wooden fence, and the non-banded side of the netting is hung from articulated rod-brackets attached to the fence at regular intervals. Cat-Fence-In also offers tree guards, special hardware for using their product with gates and other products for different situations. Plastic netting attaches to the fence with a thick plastic band which is very effective at keeping cats and other critters from getting under it. Netting itself is thin and tears easily. Plastic band can actually cut the netting if it is "worked" by a determined cat long enough. 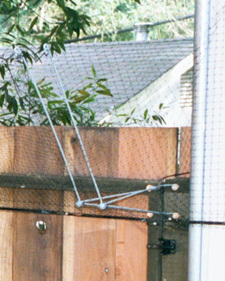 The two-piece brackets can loosen up over time and cause the vertical part to drop, lowering the edge of the netting and opening a possible escape route. Occasional inspection is important. This product is available in two configurations; a free-standing post-based system, and a "fence-topper" for existing wooden or chain-link fences. Posts are driven into the ground and topped with spring-loaded articulated "arches". A tough plastic mesh is attached with zip-ties. In the free-standing product, the mesh hangs down to the ground and a strong metal wire mesh "chew guard" is installed along the bottom to prevent cats and critters from getting under it. Time consuming and tedious to set up. Requires ground soft enough to drive in 18" x 1-1/2" pole stakes and 12" wire stakes. There is a great variety of products like these which can be purchased from several retailers, including Home Depot, and online through Amazon.com and others. Modular metal kennel components are a great option when space or permanence is at a premium. Pieces can be fitted together in a wide variety configurations. You might not think of using dog kennel components for a cat enclosure, but I've noticed many kennel products specifically marketed as "cat enclosures" are too small and not modular enough for different sizes and configurations. Products like these offer several kennel sizes, styles and finishes, roofs, panels and accessories. The kennels are constructed from 5' x 6' panels connected with simple metal brackets. What I like about the dog kennel products. All these companies have great customer service. They are also good at helping you determine what you need for your particular situation. If I had to pick one, the most practical seems to be the Cat-Fence-In product, however, my experience has shown the best solution seems to be combining components of several products for a customized solution that fits your needs. There are many other enclosure products available in many shapes, sizes and configurations for both indoor and outdoor applications. This review only covers the four products I have actually used in the process of providing safe, outdoor space for our 3 cats. I am adding the following website resource as a very promising option for cat containment. Although I have no personal experience with their products, the modular "Cat's Den" system looks very durable and practical. I'm seriously thinking of purchasing Cat Fence-In and have been searching for reviews. Yours is one of the few that does not seem to have been posted or sponsored by the company itself. You think that it is a good option if inspected periodically, and with supervision after installation? Most certainly. Inspection is important so you can keep tabs on the product's condition. You can order replacement components easily from the manufacturer. They have been very good about that. Thank you for your interest. Indeed, I am not associated in any way with any of these companies, but I have used all their products. I would agree with your choice. And, yes, periodic inspection is key - frequency dependent on level of sun exposure and the determination of your kitty to find the weak spots. A word of advice, reinforce the netting where it goes around inside corners. Those seem to be the first areas to go since kitties can put more concentrated force in a smaller area. I installed 18" triangular pieces of 3/4 plywood in in the corners and ran the band across the long edge, thereby avoiding full 90 degree corners. Good Luck! Thank you so much, Rob! (I'm sorry I got your name wrong before). I'll give your tip about the corners directly to the handyman who will install it. Our cat got hit by a car (broken jaw in several places, neurological deficits, and flail limb) but has miraculously recovered from all of it though of course the jaw is stil healing. He is quite well enough to be very, very, very angry about not going outside. I think this will work for him bc he never has really been nimble enough in his entire life to navigate our 6-ft privacy fence very well. Many thanks again--I spent hours researching this stuff and you made it easier. The advice is so helpful. Best regards. Thanks for this review, Rob, very helpful. I am deciding between the Cat Fence-in and the Purrfect Fence-topper conversion kit that can be attached to my existing fence. Both seem to be comparably priced. Your note about degradation of the mesh in the Cat Fence-in product due to sun exposure is helpful (and concerning) because I live in Florida. It sounds as if this product might not be as durable in my environment as the Purrfect Fence mesh. Any thoughts? Our netting is made of polypropylene, UV inhibitors are added in the making of the netting, the typical customer in Arizona will get at least 10 years of use. It is important to go around and tighten bolts and screws and netting every once and awhile. Like anything, that is in the outdoor elements, they will wear. The netting is designed to be thin, so that it will be nearly invisible, also stray cats from outside will not try to walk on it, it's also plenty durable, a cat trying to get out, will jump to the top of the fence and encounter the netting and go back down, a cat cannot hang on the side of a fence, like a squirrel would on a side of a tree. As long as you give them nothing to sit on or perch themselves on, they cannot tear or chew on the netting. We do offer a one year warranty. My HOA told in the letter we could put spikes on the fence to keep cats contained. Do you think that's humane? Would't cat fence-in be a better alternative and no more visible as spikes? Spikes are not humane. I know of a cat who tried to escape a yard with spikes and impaled itself on a spike, causing serious injury. I would suggest keeping your cat indoors all the time if they will not allow some kind of safe barrier. Please don't use spikes, your cat will still try to get out and hurt itself. Has any of these products changed since you first reviewed them? All these products seem to generally be the same from year to year. Hello everyone. After a lot of research we chose the affordable cat fence. they replace broken stanchions for, well forever, and we have had a few go down with heavy snow over the years and they have with no problem. I did have to replace the netting once, it's been 5 years. The netting is not plastic, it's a propylene of some kind and it's fairly tough. It keeps the cats inside when we keep it and good repair, I walk and repair the fence every month,and it doesn't always need it. We had one little rascal go under though! We had to put 12" pavers along the fence as this little 7lb cat would push an 8lb cinder block away to dig. She can't push it away from the fence if she's standing on it, the fence is chain link, she hasn't tried the wooden one on the other side, there's a dog there. We have a medium to large yard and it cost us approx. 400.00 for everything. Best money I ever spent, as our back doors are open all summer as we have a large garden and are in and out. Happy cats and humans too. I am wondering about the portable dog fence. Wouldn't cats just climb up and over? Or does this have a top on it? I use components from other fence-topper products to create a cat-proof barrier along the top of the fencing. Wow!! It's really amazing and I liked your blog too Robin Jeffrey Watson.Commercial Fencing Calgary by http://firstclassfencing.ca/ are also unique, strong, durable and wonderful to look at.